1. One fourth of a mile; two furlongs. 2. Either side of a horse's hoof. 3. often Quarter A specific district or section, as of a city: the French Quarter. 2. lateral or medial sides of the wall of the hoof of the horse. 3. one of the four individual glands in the udder of a cow. a quarter in the udder of a lactating cow that does not produce any milk when the other quarters are doing so. Caused usually by a prior attack of mastitis. crack in the lateral or medial wall of the hoof, beginning at the coronet. Usually cause no lameness. percentage of udder quarters at risk in a herd found to be infected with mastitis-causing bacteria by bacteriological examination of quarter samples of milk. May be as low as 10% in herds utilizing a full mastitis control program. See also mastitis infection rate. designs made in the haircoat of a horse by grooming the hair in a direction the reverse of its normal growth pattern. 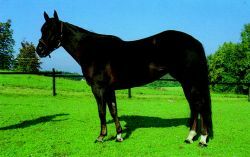 an item of horse clothing; a lightweight half blanket covering the horse from the girth to the tail. These gains translated into a 4 percent annual rate advance in real disposable income in the first quarter, after a significant 2 3/4 percent advance last year. The market here for the first quarter was very, very strong," said Williams. At an average of $1,181 per s/f, townhouse prices were 11% higher than during the first quarter of 2004. In the nonresidential construction area, real investment continued to expand in the first quarter. Despite the nearly 65% revenue increase we expect to achieve over the first quarter of fiscal 2006, that growth is not sufficient to offset the negative turn of events for one of our clients nor the operating decisions we had to make in the quarter. 2 percent in the third quarter and remained at that level through the first quarter of this year. Net profit increased 326% from $102k in the first quarter of 2005 to $434k in the first quarter of 2006. During the first quarter of 2006 the Company launched its generator sales operations in South Florida including the initiation of a radio advertising campaign, the hiring of a sales force and customer services representatives and installation crews. This was due to an increase in the number of larger lease transactions -- deals measuring more than 50,000 SF accounted for about 48% of the total activity in the first quarter of 2001, up from just 24% a year ago. The national median existing single-family home price was $217,900 in the first quarter, up 10. Among the three price records set last quarter, the Real Estate Board of New York's (REBNY) first quarter 2000 Manhattan cooperative report reveals that the median price for a three-bedroom cooperative apartment reached $246,563 per room, the highest per room co-op price reported since REBNY began issuing these figures, and a robust 43% increase over last year's mark. The net loss for the first quarter of 2006 totaled approximately $3.